A cynical soul would suggest that Christmas music — that inescapable tripe pumped into stores, shopping malls, radio stations and parking lots — represents the worst traits of a heartless pop music industry concerned more about cash grabs than good cheer. And they’d be right. A quick scan of the top selling albums on iTunes at the very moment of writing this includes Christmas albums from Pentatonix, Michael Bublé, Boney M, the Now 25 Christmas compilation, something called the 30 Stars of Christmas, The No. 1 Christmas Legends, A Charlie Brown Christmas and holiday songs from Blue Rodeo, all in the Top 20. By the time the Top 50 is scanned there are another 11 Xmas albums from the likes of Johnny Reid, Kenny Rogers & Dolly Parton, Mariah Carey and Elvis Presley. These records are all garbage. Sure, there have been a few moments of festive music glory in the past. Like Bing Crosby & David Bowie’s “Peace on Earth/Little Drummer Boy” from 1977, the supercut of Darlene Love singing three decades of “Christmas (Baby Please Come Home)” on David Letterman, or Canned Hamm’s heartfelt ode “Rum And Eggnog.” These artistic high-waters remain isolated incidents, though. Truly rare moments of cosmic Christmas spirit manifesting itself into beautiful music. Never has anyone been able to build the concept of Christmas music into a full album, an uncompromised, unimpeachable work blessed by the holy hands of Santa Claus, Jesus and the new commie Pope. 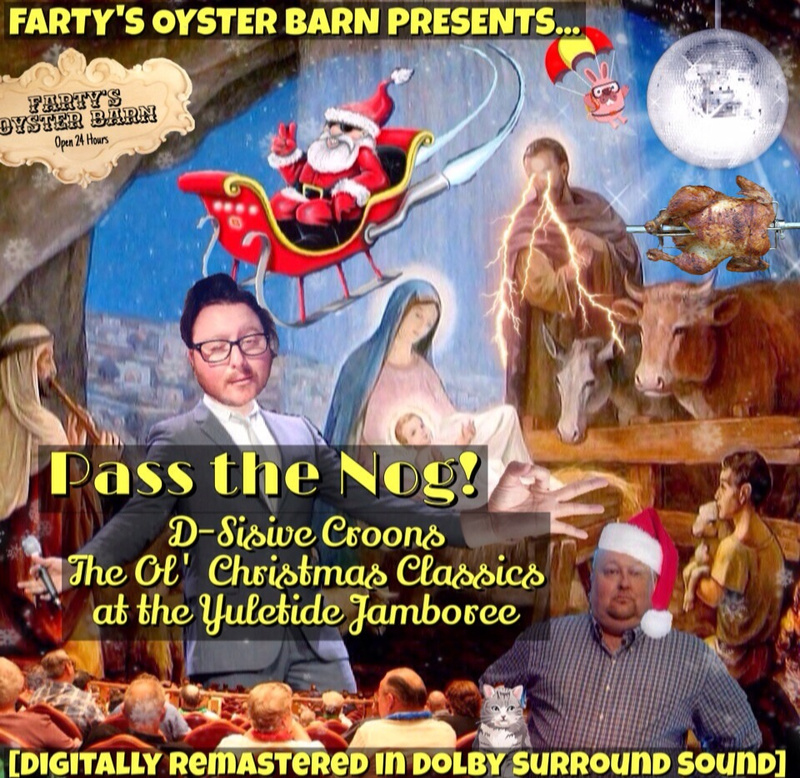 Farty’s Oyster Barn Presents… Pass The Nog! D-Sisive Croons the Ol’ Christmas Classics at the Yuletide Jamboree, the new Christmas album by internationally recognized rap-crooner D-Sisive is that unique gem of an album. Recorded live at the Newmarket Cultural Arts Centre, the multiple-time Juno Award nominee lends his voice to classics like “Here Comes Santa Claus,” “White Christmas” and “Joy To The World” with a beautiful gravitas not even his romantic and professional rival Bublé can match. In fact, the passion on display in Pass The Nog is so strong there are multiple points where the spirit compels D-Sisive into fits of swearing mid-song. Taking the Lord’s name in vain around Christmastime is undeniably a sin, but there’s no vanity here. This is the Christmas spirit personified: the sparkling lights of the tree, the sound of reindeer on the roof, the lecherous gaze of Santa Claus as he kisses your mom… this is what we’ve all been waiting for.